The flag of South Korea is sometimes called the world’s most philosophical flag (Korea: Enchantment of the World, by Patricia K. Kummer). It has been in use since 1882, except that it was outlawed from 1910 (beginning of Japanese occupation) until 1945 (end of World War II) (Land of Morning Calm: Korean Culture Then and Now, by John Stickler). 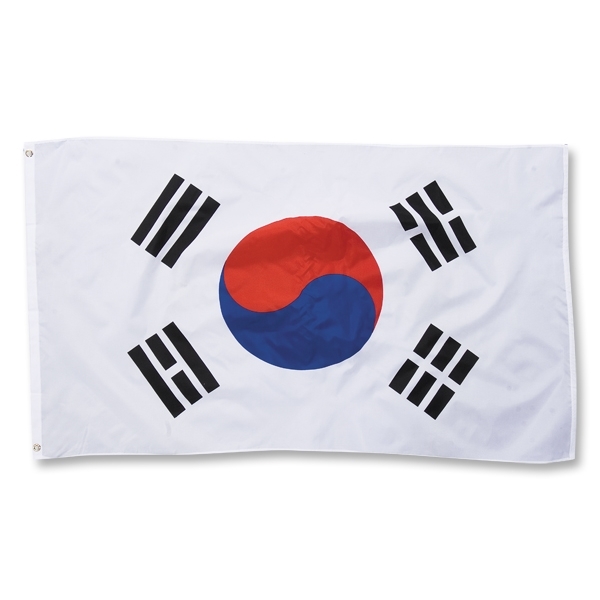 The white background of the flag symbolizes peace (http://www.barrel.net/korean_flag.php) and the purity and peace- loving spirit of the people of Korea (Korea: Enchantment…). In the middle of the flag is a circle that is divided into two colors. The shapes formed by these colors seem to be in motion, each continually heading toward the other. This is the yin- yang symbol which is often represented in black and white. The yin and yang is an ancient Chinese concept that dates back approximately 3,000 years. The oldest known eum- yang symbol is in Korea, carved into stone at a Korean Buddhist temple and dates to 682 A.D.
“[The yin and yang] refer to two qualities of universal force energy or qi, and are represented as the positive and negative poles. They are inseparable tendencies of this energy and cannot exist without each other. All energy and material forms have these positive and negative polarities, just as electricity has a positive and negative charge. Yin and Yang are opposing polarities but are, in fact, complementary…” (Journey to Mastery: Feng Shui for Life by Dr. Kathryn Mickle, Ph. D.) In Korean the red (or white) half is called yang and the blue (or black) half is called eum. Four of these Trigrams are the symbols that surround the taeguk on the flag: from the lower left corner, proceeding clockwise, in terms of their elemental relationships, they are; Fire, Heaven, Water and Earth. In Korean they are pronounced (in the same order) Yi, Kun, Kam and Kon and together are known as “Kwe” (www.barrel.net…). They also have many other meanings; in the same order they can also represent East, South, West and North; Dawn, Noon, Dusk and Night; Spring, Summer, Fall and Winter (http://en.wikipedia.org/wiki/Ba_gua). Fire also represents radiance and envisioning common goals; Heaven is also force, persist, sovereign, struggle and enduring; Water also represents gorge, black, and dangerous place; while Earth also indicates field, yield, and the “ground on which [the] human world rests” (Land of Morning Calm…).